For Part 2 I am going to cover more gun related mistakes, or missteps. In all honesty, the first time concealed carry holder has more avenues for research and advice than 11 years ago. One need only look at the internet and you can find scores of websites that simply didn’t exist in 2005. Compare that to what is available now; sure, there is a lot of crap out there, but one trends the information you will see common areas of agreements. That is a clue. With that in mind, I am going to come right out and offend people. Utter reliability, fantastic accuracy and concealability – a fine pair of CCW guns. A LOT of people love the 40 S&W; I am not one of them. There is a common misconception that it was created to fill the void between the 45 ACP and 9MM, but that is not fact. Following the 1986 Miami shoot out – a shoot out was so pivotal the FBI actually made a training video about it – the FBI realized they needed to replace their venerable revolvers. The FBI worked with with Smith and Wesson to develop a handgun that shot reduced power 10mm loads in a S&W 4506 frame. Smith and Wesson promptly realized the reduced powder load meant the 10mm cartridge could be shortened, and thus the 40 S&W was born. When it was developed and placed into service in 1990 and into the early 2000’s the round offered a significant advantage over 9mm in power and 45 ACP in capacity. But as time marched on that advantage against the 9mm has grown less and less. With current 9mm ammo the advantage of the 40S&W pales against the disadvantage of 1-2 less rounds, harsher recoil and greater ammo cost. To be fair I never had a problem with any 40 S&W I owned, but I don’t regret selling them and buying the 9mm’s either. In my experience most people shoot the 9mm better and quicker than a 40 S&W in equally sized firearms. If you want to shoot big bore because you think you really need it go with 45 ACP or 10mm; alternately you can move to a revolver and load up 41 or 44 Magnum and carry a gun that will cause you to list to one side. Sidebar: the 40S&W seems to have found a solid home with competition shooters because it can be downloaded while still making “major” power factor. 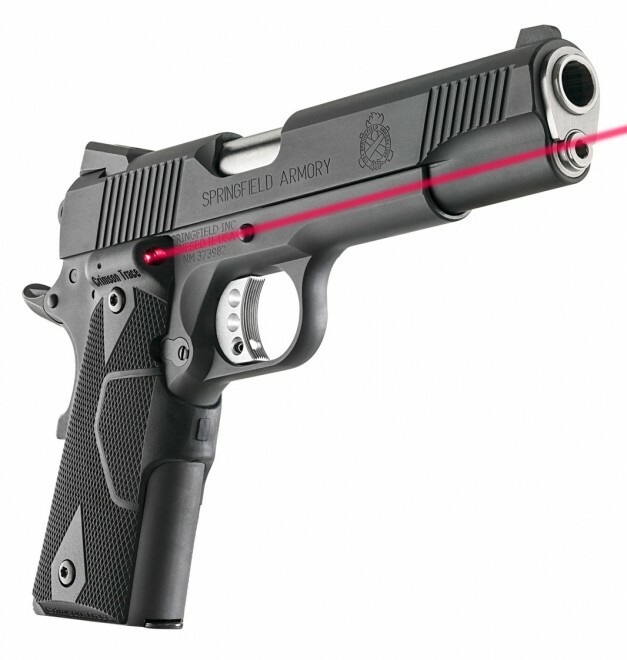 This gives the competitor a softer recoil and more rounds than an equivalent gun chambered in 45 ACP. Lesson #4: The round was losing favor with instructors when I bought my first gun chambered in 40 S&W, circa 2007. Nevertheless I bought it based on the advice of people who should have known better. In all honesty I can’t say I wouldn’t follow the same route if starting over in the same period of time. But if starting out now, I wouldn’t even bother. Get a 9mm with modern ammo and be done. I can already hear the Glock fans warming up their gaming computer in their mom’s basement to let me have it. Let me open with a fact. The Glock is a fine weapon and I have no beef with it from a functionality, accuracy or cost perspective. I just don’t shoot them well; and I can safely say it is me, not them. Not one to give up, I disregarded the fact I don’t shoot them well and have owned 5 different examples over the years, including models G22, G27, G26, G19, G26 again and a G35 (the G22 and G35 were not for CCW). I spent a lot of money and ammo trying to make them work for me instead of focusing on a platform I shot well. In all fairness I recently had a chance to shoot my cousin’s G23C and was pleasantly surprised to see I shot that Glock better than any other. I am positive it was the result of being a better shooter overall. I find them to be as exciting as a framing hammer, but if you were dropping me off in Beirut tomorrow they would be on my short list of handguns too take. Lesson #5: Recognize when something isn’t working for you and stop trying to make it work. This isn’t a hot rod, or a race gun, this is a tool that might save your life. If there is another reliable, quality firearm you shoot better, go with it instead. Yup, I’ve owned one and can safely say the PF-9 was the single worst firearm I have owned. That thing would malfunction just looking at it. Again, I bought this after reading some magazine reviews. FAIL. I literally have nothing good to say about this gun. The Yankee Marshall has a video where he declares it the worse handgun ever with his reason being the damn thing is marketed as a CCW weapon where as other cheap guns don’t hide their lack of quality. He is 100% correct! My copy was laughably bad and research shows that experience is beyond commonplace. Lesson #6: This is the gun that opened solidified my disdain for gun magazine reviews. It opened my eyes to the lack of scruples in some writers. Going back now, the article that sold me on the PF-9 was written in a way that wasn’t praise, but didn’t come out and call it junk either. As I noted last time, through all of the guns I bought for CCW, and through all the rounds fired, one thing remained constant. I was wasting money on guns, transfer fees and holsters that would have been better spent on defensive classes and practice ammo. When it comes to your carry weapon, chasing the latest gear rarely gains you skill and is seldom worth it in the realm of firearms. In Part 3 I’ll go over some mistakes in gear to try to give first timers a better start than I had. I do agree for CCW don’t even bother with 40. I’m a 40 fanboy but I would not carry a 40 if I don’t have too. 9mm all the way. Only because I believe you should carry high quality factory self defense rounds. And here is where the calibre wars die. Because all defensive ammo is engineered to deliver the same payload; 12 – 14 inches of penetration, reliable expansion and weight retention. So they charge the 9mm more and dumb down the 40 and 45. If you reload you will know that a 9mm will never do what a 40 or 45 can do. Pushing much heavier bullets at pretty much the same kind of speed produces much more damage in material. However for self defense this is useless because you’ll just have over penetration. Ever shot pins that have been riddled with rounds the entire day (that it retained) and move that heavy thing off the table with a mere 9mm? It’s just not happening. The laws of physics still apply. Yes, even to the wonder 9. Hence you can’t shoot 9mmP (let’s quantify that with the P before some smartass chimes in with “what about 38 super”) in major in IPSC. Kind of hart to push a 124gr bullet to make a 170 factor. So all calibres are not created equally and bigger calibres are more powerful. However in the context of self defense all bets are off and all are designed to deliver the same payload and in that case I’ll take 9mm over anything else. More beans in the beanshooter, cheaper, easier to shoot and you can find it everywhere. 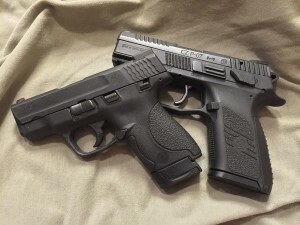 One thing in defense of .40 – if you have someone who’s really budget conscious but still wants to get a quality defensive pistol, there are some seriously legit deals out there on police trade-in guns in .40 S&W. Maybe over there in the States. Not so much here in South Africa. What they don’t know is I just pop in my 92FS’ barrel and mags and I have best of both worlds in that 90Two. Not that I would CCW it in 9mm configuration. Don’t tempt fate. I agree on the 40. I only own one 40. The only reason I bought it was for ammo shortages. I got into firearms just before our current president was elected. Boom, my first ammo shortage was experienced. Some years later, Sandy Hook happens. In both cases, I found the 40 round the easiest to find during the shortages. To compete in IDPA, I got a 40. I prefer the 9mm in CCW and IDPA. I do a better job of having a surplus of 9mm ammo. Still, i have one 40 and one 45 for shortages. A good rule of thumb in choosing a CCW piece is: Carry what the cops carry. You can blither all you want about the cops’ being poorly trained (some are, some aren’t), but their pistols are chosen for reliability and ease of use by a diverse group of people. The cops don’t carry Kel-Tecs; they carry Glocks, Smiths, Rugers, Sigs, or Berettas. You should, too. At least, carry something with that level of quality. If those are out of your price range, either step down one tier or find the above guns used. Police departments change guns fairly often, and there are usually good PD trade-ins on the used market. If you have to use it and end up in court, you will look better to a jury of non-gunnies if you can say you use the police as a model for the proper equipment. Any issues with the Ruger SR9C to speak of? My wife’s is an early model and had some light strikes when we first purchased it; which Ruger corrected. Now, 1300 rounds later, it is stone reliable and accurate. My SR9c was reliable and accurate through 900 rounds. I used it in a couple of low round count evening classes (under 400 rounds) and never had a problem. I sold it because it didn’t really fill a need once I bought the CZ P-07. Caleb did a lot of testing with the SR9c years ago, but you’d have to ask him for his opinion. I know Michael Bane speaks highly of them and carried one until he decided to go all Glock for his self defense and competition weapons. It will never be a gun recommended by “Tier one-half stealth Ninja” but it is absolutely fine for the needs of a normal person in real life. If facing a drunk and disorderly idiot, who is raising hell at the stop and rob, the SR9c is fine – if you’re being air dropped into douchebagistan, to face the zombie Huns, I would choose something else. Was this in foreign language written and then translated Google in? Weird construction of sentences was – and many hard to read! Grating it is. I thought the .40 Short & Weak was designed because the original FBI specified 10mm rounds were too difficult to shoot by agents and cadets, resulting in a need for a reduced load. With that power reduction came a realization that less case capacity was required, and the resulting .40 S&W could be used in slightly modified 9mm pistols. Sigh. People who refer to the .40 S&W as “Short and Weak” grate on me worse than poor grammar. The FBI went with 10mm and then .40 because they had already passed over 9mm and wouldn’t admit they made a mistake. No, it’s just at the time the 9mm was not what it is now. More so if you compare it to the fact that they were giving up 357 magnums to go to pistol. I’m sure at the time if the 357 Sig was available they might have gone that route. Hind sight is always 20/20 but also keep in mind the context of the times when they made their decisions as well. caleb what are you carrying now.? Right now I’m carrying a 9mm 1911.